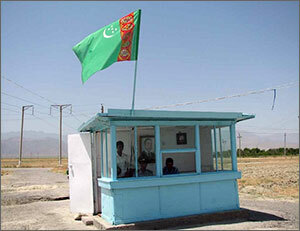 Turkmenistan is constructing several layer fences using barbed wire, AfTAG reports. The fences are being erected along the Karkin and Khamyab Districts in Jowzjan Province, Afghanistan. The Turkmen authorities are thus trying to inhibit the Taliban and other militants from infiltrating into this Central Asian country. Ashgabat has good reasons to worry: there were many reports lately on armed clashes between the Afghan army and opposition near the Turkmen borders. For instance, in late February 2014, a group of Afghan militants has illegally crossed the Turkmen border and shot three Turkmen border guards dead. The official Afghan sources stated that the Taliban movement was responsible for the attack. However, four days later, the Taliban denied involvement and accused the Afghan government of attempting to discredit them before neighbors. Fergana also reported earlier that units of armed ethnic Turkmen volunteers were protecting borders on the Afghan side of the Afghan-Turkmen border, which spans almost 750 km. According to Radio Azatlyk (the Turkmen service of the RFE/RL), a certain Gurbandurdy, the leader of these volunteers, urged the Turkmen government to support them in this matter.